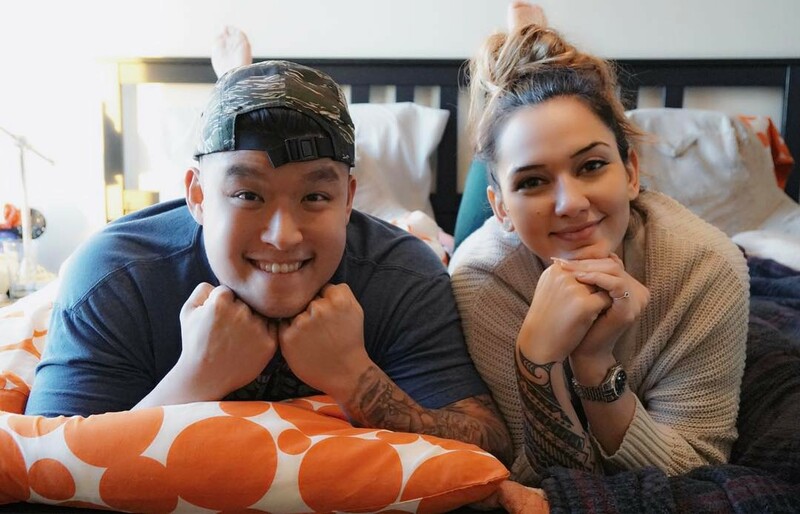 Bart and Geo Kwan are one of the Youtube couples that are for me #couplegoals. They’ve been together for a few years and just had their first non-fur baby! I first knew of them from Just Kidding News and since then, I’ve been faithfully watching their vlogs. Why do I watch their vlogs? First of all, I love watching vlogs. It’s one way for me to experience life without going out. Watching Bart and Geo’s life through the screen makes me feel like I’m also there with them. I’ve watched them vlog in their old house which they shared with Nadeem. I’ve watched them look for condos in downtown LA and ‘helped’ them choose the perfect one (and by help I mean offering my opinion on my laptop screen). I also got quite teary-eyed when they finally bought their first home where they get to build their ever-growing family. I got worried when Brigee got lost and all of the JK squad were out there on the lookout for her (they found her!). Their vlogs shows the perfect couple (Bart says they’re not because they don’t show their fights and stuff) that they are who stuck with each other through their ups and down. They have been together since the early days of JKFilms where Bart said that Geo had to mostly support them financially so Bart could focus on growing the company with Joe. I’m amazed how amazing Geo is to step up and support Bart’s dreams wholeheartedly even though being a full time Youtuber at that time is probably a very risky move. Years later, they own their company/gym, Barbell Brigade, have three fur babies, Brigee, Meatloaf and Fawn, and a newborn, Taika Octavius Kwan. OMG THEIR FAMILY IS GROWING! When Bart and Geo got married, I immediately thought of how them having babies. When they announced that they’re pregnant, I cried. I was so happy for them and I remember hugging the heck out of my teddy bear because… bear… Beaws. Anyway, I feel like that’s the closest thing that I can hug that can be related to both of them. I watched all their hospital visit vlogs, got heartbroken when Geo couldn’t go to Tiff’s wedding because it’s too close to the due date and the things Geo and Bart did to make sure her and the baby is healthy. I watched some recent JKNews and I’m like, wait, where’s Bart and Geo? I started looking through their IG and other members’ IG if they posted photos about her giving birth. Then a few days ago, Geo finally give birth! I was so excited to see their baby. I’ve been there through the room decoration, gender reveal and babyfying their life. Now, I can’t wait to see their vlog prior to the birth and after. I can’t wait to see them being parents and the baby interacting with his fur siblings. I present to you the royal King Taika Octavius Kwan, ruler of the Beaw world! Born 9/1/17 at 4:12am at 9lbs and 21 1/2 inches long. You guys I'm so in love it's unreal. This has been the most challenging thing I have ever done my whole life but it was definitely the most rewarding. This has definitely strengthen the already strong bond @bartkwan And I have. Don't think it would have been this amazing and memorable without you, Papa. I love you. And for the rest of you…I cannot wait to share more of mine, paw beaws and Taika's progress in the future. For now I'm gonna get some rest! I could go on and on about this couple but no words can express how happy I am to be atleast part of their lives even if they don’t know me. I’ve seen them grow from boyfriend/girlfriend to parents of their babies. I’m looking forward for more vlogs!